Our sincere thanks to Peter Alliss for giving his time to present the trophies. Boys: Harry Willsher(Canford Magna) beat Toby Long 3&2 and Jack Baker beat Jonathon Naylor (Parkstone) 2&1. in both semi's the games were tight and from a spectators view both were great scraps. Jack Baker (Knighton Heath) won the final 1 up having turned 1 up at the 10th. 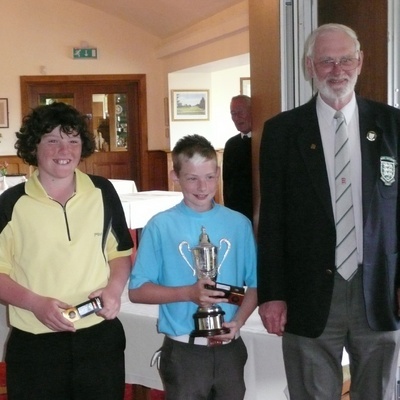 This was a great contest between two of our up and coming under 14's with some really scintillating golf played by both. Congratulations to Jack and my sincere commiserations go to Harry. Girls: Alice Davis had a great match against Chloe Stanley winning 1 up. 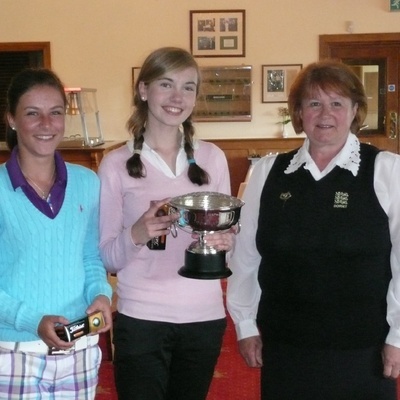 Sarah Webb won hers also 1 up against Lucy Walters who was disappointed after a closing birdie, par, birdie finish. Sarah had also birdied the 18th to retain her one hole advantage. The final was a real see-saw with Alice Davis(Ferndown) never up against Sarah Webb(Canford Magna) in spite of her long driving off the tee. They turned all square but the match continued to be very tight until Sarah finally at the second extra hole with a par against a bogey after a rare weak putt by Alice. Great match to watch. Presentations were done by Mr Ian Clark County President of Juniors and the Jackie Wilson County Ladies President after a warm welcome from the Ferndown GC Captain. The Peter Alliss match play got under way with the sun shining, the top sixteen boys were drawn and the OOM winner Samuel Brooke got us under way against local lad Spencer Rumble and Sam used his shots to good effect coming out on top 3&1. In form Harry Willsher made short work of his match winning 7&5. Toby Long won comfortably as did Brodie Bowers and Jack Baker defending Champion Oliver Stocks found it hard going giving shots to Noel Campbell-Hunter and was continually having to come from behind sadly for him a wayward second at the seventeenth saw him go to the last one down and a half was enough for Noel to send the champion home empty handed this year. Young Alex Dytham and Jonathan Naylor had a tussle along with the Ben Small and Oscar Perry both games were tight with Jonathan and Oscar winning by one. In the afternoon Samuel who is only nine ran out of steam as Harry won 4&3 Toby saw off Noel and Brodie was thumped 6&5 by Jack Baker, the last match was nip and tuck and Jonathan won sixteen to go one up sadly for Oscar his tee shot on the seventeenth found the heather and he struggled to get it back to the fairway and thus lost the match 2&1. So the semi finals line up as Harry Willsher Canford Magna plays Toby Long Broadstone and Jack Baker Knighton Heath takes on Jonathan Naylor Parkstone. Spectators are more than welcome. The girls matches saw Alice Davis go through to the semi final beating Serena Bosch 4&3, whilst Lizzie Turner could not keep up with the big hitting Chloe Stanley who won 2&1. Sarah Webb got through as her opponent is still stuck abroad thanks to the ash cloud and Lucy Walters turned on the heat after the turn to see off Sianell White 4&2. The semi final line up is Alice Davis Ferndown against Chloe Stanley Knighton Heath and Sarah Webb Canford Magna plays Lucy Walters Knighton Heath. On a dry and sunny Sunday the final round of this years Alliss got under way at Crane Valley. The girls found the scoring hard going but defending champion Alice Davis had a super 36 points to secure her place in the Match Play phase. Ben Small Broadstone and Samuel Brooke Canford Magna came out on top with a grand 39 points each, followed by Alex Dytham also Canford. Young George Seed from Lyme had a great 36 points but it was sadly not quite enough to make it to Ferndown. Spencer Rumble just pipped George Davis and Tyler Holly for the last match play place on the countback related to the third score. With the torrential rain we have had lately we were lucky only two greens were out of action. So with it being a non qualifier the boys set about building scores with several players getting over forty points. The course proved favourable with the higher handicap player's which makes the last round at Crane Valley even more interesting as players jostle to make the top sixteen places. Sadly due to the inclement weather and the lack of light this round was not completed and has been withdrawn from the Boys OOM but will stand as part of the Girls. Well with the sun shining and a stiff breeze this years Alliss got under way at a very well presented Broadstone GC. Defending Champion Oliver Stocks led the way and did not disappoint as he came in with a very good score of 38 points which was the best of the day and sets him on the way to defending his title. New comer Brodie Bowes from Yeovil shot a good 35 points to take second place and Spencer Rumble from Ferndown came third with 33 points. What is good this year is to see clubs like Christchurch / Iford and Chedington being represented and we look forward to meeting up with you all soon at Sherborne.